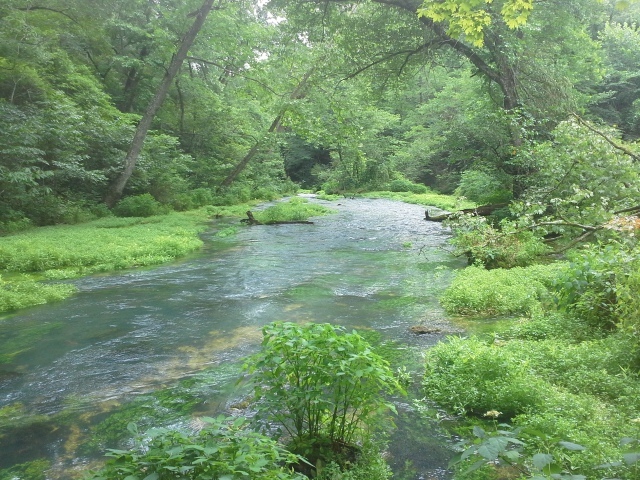 Along the Current River, across from the Pulltite Campground in the Ozark National Scenic Riverways, is a natural wonder that is hidden up a lively spring branch that feeds narrowly between two imposing hills. On our last trip to the ONSR, we took a float trip from Pulltite to Round Spring, and soon after we started our canoe voyage down river, we pulled off on a gravel bar on the right to hike up the short trail against the bluff, past the spooky old cabin, and over to see the light blue gem that is Pulltite Spring. From the intersection of Highway 19 and Highway 106, take 19 north for about 20 miles to Route EE. Turn left (west) on EE, and go another 4 miles to the Pulltite Campground. From this point you have 2 options, and both of them involve getting in the river (I KNOW, you’ll just HAVE to suffer through it). From the gravel bar beach at the campground, you can set off downriver in your watercraft of choice, soon enough coming to the spring branch where it feeds into the Current. Or your other option, which is to head to the end of the campground to the group sites, and find the trail that takes you to the river across from this little confluence. So are you floating or just dipping the toes? 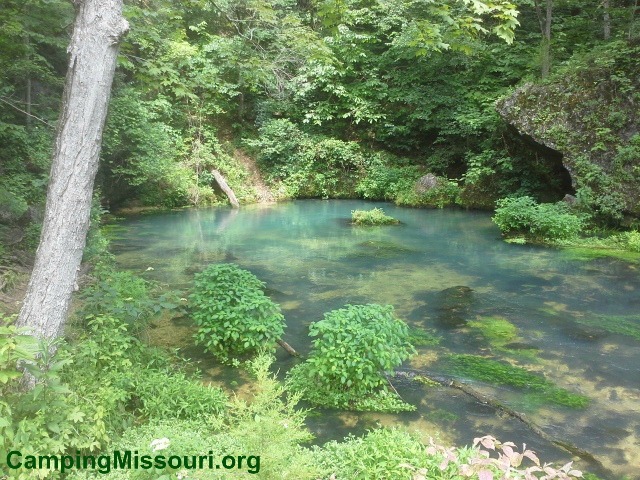 Once you get to the other side, it is probably an eighth of a mile hike back between the hills to where Pulltite Spring comes out of the foot of the hill. Pulltite Spring is one of the smaller springs (that I have visited) in the ONSR, with a daily flow of about 30 million gallons of water (hardly a trickle, right?). 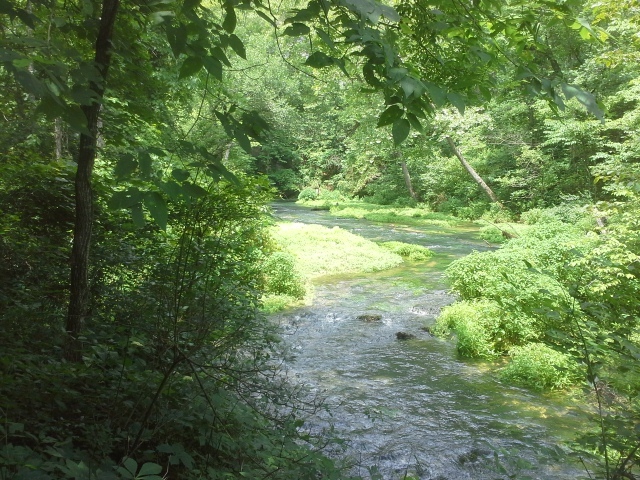 Apparently it is named for the way in which the locals had to closely and carefully control their horses as they pulled wagons through the steep nearby terrain when visiting Watson Mill on the spring branch to have their grain crushed. And it turns out that back in the late 1800s and early 1900s, there had actually been three mills built at different times that used the rushing water from this little spring. Not bad for a place that you can only reach by boat or foot these days. 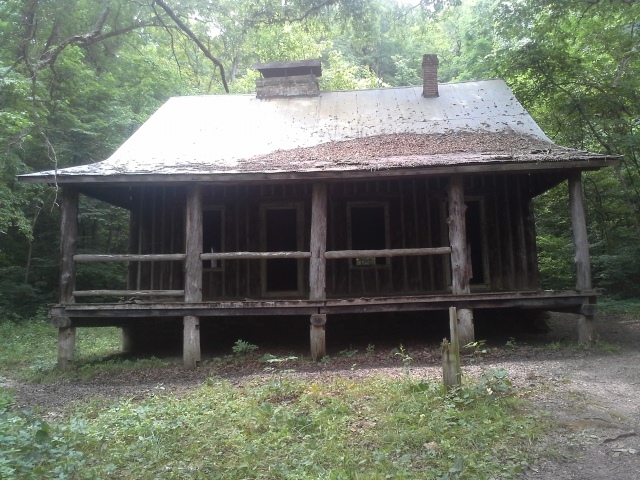 The nearby Pulltite Cabin was built back in 1913 by a group of six men who had visited the area on a float trip. It was intended to be a vacation spot, and is built with its logs in an upright position. This is considered to be a French style log cabin, which allows for less notching of the timbers during construction. It is open and you are allowed to walk inside, so remember to be respectful and take care not to damage this hearty and historic structure. This is an area that does not get regular maintenance, due to its remoteness, so please visit it with the respect and attentiveness it deserves. Take any trash you create back out with you on your trip, and do your part by bagging any trash left by other, less compliant visitors. As with all springs, avoid the urge to jump in the water. Because of their lower temperatures and mineral content, along with the general cleanliness of water filtered through the ground, they are home to plants and animals that don’t often live anywhere else. Please do to not disrupt the gentle balance of this little ecosystem, and enjoy the scenery from dry land. Along the trail going in, I didn’t really notice any Poison Ivy, but back by the spring and the cabin I did see some. Lurking in the underbrush and around a fallen tree, keep your eyes open to avoid this irritating plant. The last thing you want is to come back with itchy souvenirs to remember your trip by. 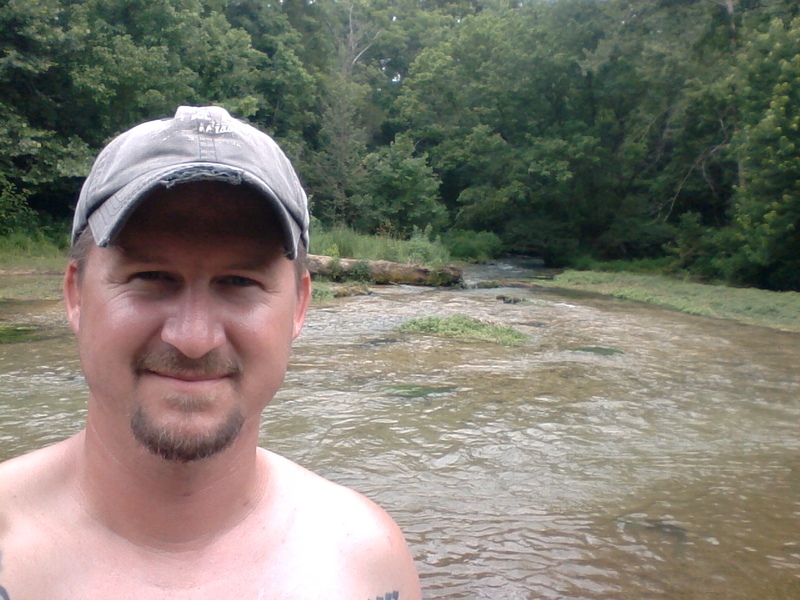 It was just the beginning of our canoe trip that day, and it was a great place to start it out with. It is kind of amazing to think that this spring fed little creek back within these sharp hills was at one point the industrious center of the local people, but I think it speaks to the resilient heartiness and ingenuity of those who called it home. 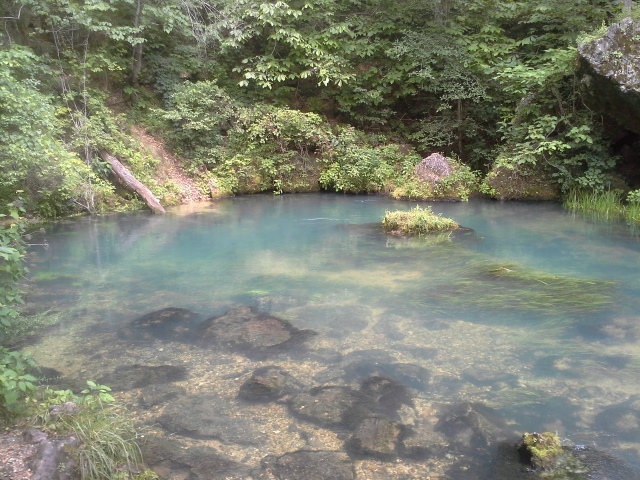 Truly a hidden gem, I like to imagine how fun it would be to spend your summers at this vacation home, next to the pretty and underestimated Pulltite Spring, back a little ways in the forest off of the gorgeous Current River. Nice blog. I did notice that you said head north on 19 and turn to the right, which is west. Unless you are in the middle of a switchback, turning right would send you east. I am a little confused. I might try this trip next week, but can I get across the river at that point with my camera not getting wet? Man, you are totally right. Thanks for catching that! It IS a left turn onto EE. And at this point, I would imagine that the river is at a level where you could find a place to wade across and probably just get waist deep at the most. Probably. Have a great time!